The Madrid real estate market continues to perform strongly. 2017 was an excellent year for property prices and, even more significantly, rental yields. This trend continued into January, 2018. According to Idealista, average property prices in Madrid increased 2.2% from December, 2017-January, 2018. However, there is signficant variation between neighborhoods. Keep reading to learn current pricing trends, news affecting the Madrid real estate market and see our investment recommendations. 2017 was a good year for Madrid real estate. Prices appreciated, particularly in the Center, elegant Salamanca and residential Chamberí. In fact, this traditional, family friendly neighborhood now has prices rivaling those in Salamanca. The Center (which includes the tourist areas of Sol, Las Letras, Malasaña and La Latina) also saw price appreciation, but on average prices remain lower than those in Salamanca and Chamberí. Although prices have increased, they still, on average, have a long way to go before attaining pre-crisis levels. Moreover, due to structural reforms, the strength of the Spanish economy and external factors like the Catalonian independence movement, we predict that prices will surpass 2008 levels. Rental prices have increased more rapidly than property prices in key investment areas. Rental prices in the Center are the highest in Madrid. This, combined with its relative cheapness compared to Salamanca and Chamberí, means it has the highest rental yields of all Madrid real estate. Tourism in Spain is at all-time highs. Spain is now the second most visited country in the world, after France. Moreover, tourists are starting to favor Madrid over Barcelona. This is due to Madrid significantly improving its infrastructure and Airbnb stock whilst Barcelona becomes increasingly tourist unfriendly. The City of Madrid initiates new Airbnb regulation. Contrary to initial assumptions, intelligent regulation has benefited Airbnb property owners. This new, mild regulation arguably makes Madrid the best city for Airbnb investment. The referendum in December, 2017 did little to resolve the issue of Catalonian independence. As a result, firms are still leaving Catalonia for other parts of Spain. Even the iconic Cava producer Codorníu, founded in 1551, has announced a move to La Rioja. At the end of December, 2017, there was only one Catalan domiciled company listed on Spain’s blue-chip Ibex 35 stock market index. The bulk of these companies are relocating to Madrid, which will put upward pressure on Madrid real estate prices. Madrid will arguably be the third largest European beneficiary from Brexit. This is due to jobs relocating to the Spanish capital, and Spain’s excellent Golden Visa system. The relatively low real estate prices in Madrid’s center, combined with its high rental yields, make it the ideal place for investment properties. Madrid’s lack of high-end hotel stock, combined with its increasing numbers of tourists, makes it the perfect place to invest in a property to list on Airbnb. Although there is still plenty of room for Madrid real estate price appreciation, the market is moving. If you want to make money on your property’s price appreciation, in addition to rental income, we recommend purchasing sooner rather than later. Madrid is an excellent city for real estate investment because its rental yields are so high- they equal those of New York City. The Center of Madrid has the highest yields in the city. Moving2Madrid is a buyer’s agent that specializes in, and focuses exclusively on, Madrid real estate. We help international buyers locate, purchase, refurbish, rent and manage investment properties in Madrid. Our clients typically earn returns 50-100% above average. Arrange a free, private consultation today to learn how you can take advantage of these exciting trends in Madrid real estate. Unsure of how to find the best property ? 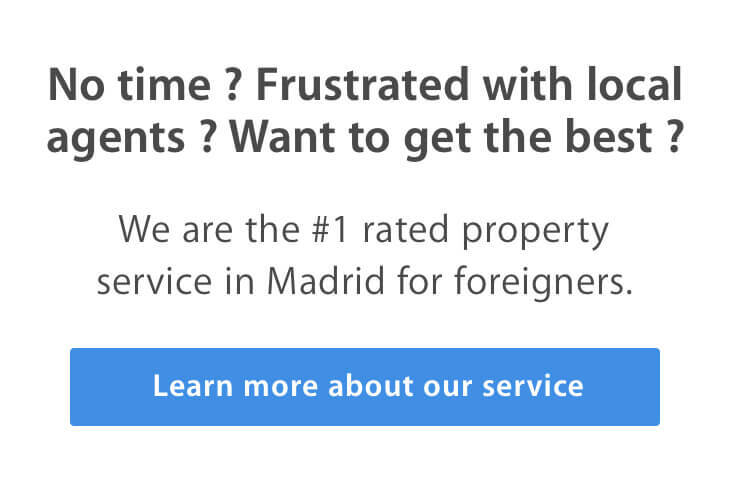 We are #1 rated property service in Madrid. We will find you the best property in the market, on time and for the best value. We provide personal property search for international investors. Are you looking for the best return on your investment, without the hassle ? We offer a certain way to double than average returns. We search all sources, leverage our network, negotiate the best price and handle all the process for you, down to managing the property, for a single standard fee payable at the end. Which European country offers the best Golden Visa?